A few weeks ago, I had the opportunity to visit the Bill and Melinda Gates Foundation Visitor Center in Seattle. The center opened in February of this year, and showcases the innovative work that the foundation’s partners are doing to address difficult challenges in the developing world in health and poverty alleviation, and in the United States through education. The foundation is guided by the belief that all lives have equal value, and that every person deserves the chance to live a healthy, productive life. The center describes the history of the foundation, and showcases studies of programs and their impact through static and interactive displays and films. It also describes the methodology through which the foundation identifies opportunities and works to solve problems. There is a strong focus on measuring impact to ensure that funds are being invested effectively to solve significant problems. 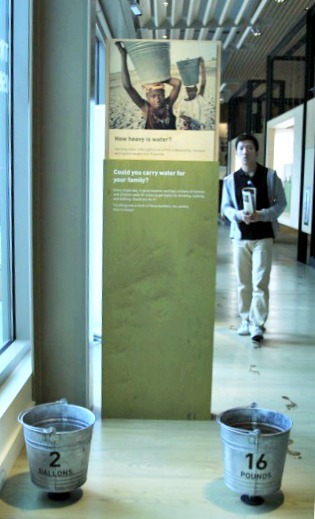 One of the displays at the center is focused on the burden of carrying water in Africa. Visitors can feel how heavy a bucket of water is, and a series of footprints help demonstrate the lengths many women and children have to take each day for water. Wells Bring Hope is raising awareness and funds to tackle this exact problem in Niger. The center has a number of interactive displays where visitors can contribute ideas or evaluate their skills and preferences for working on a cause. 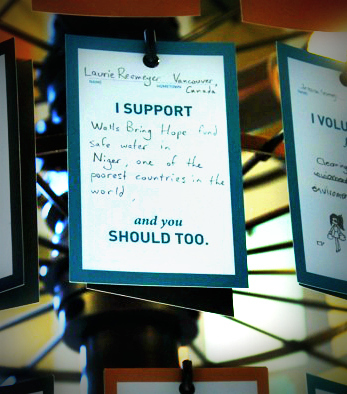 There is also a Cause Board, where visitors are invited to share a cause that they support. I took the opportunity, as a donor and volunteer for Wells Bring Hope, to promote our organization. If you are visiting Seattle, I highly recommend a visit to the center. It really made me think about some of the major challenges in the world and the important part we are we are all playing the solutions.